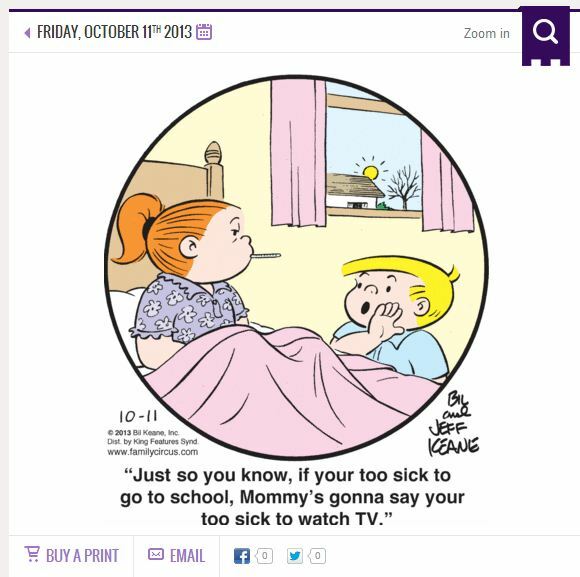 In case you need another reason to mock Family Circus . . . – Grammargeddon! In case you need another reason to mock Family Circus . . . Here is the daily comic panel for October 11, 2013. I took a screenshot in case it’s revised and replaced anytime soon. Do I need to point out the error (which appears twice)? This comic was written, drawn, colored, lettered, checked (maybe? ), and distributed. King Features Syndicate says that The Family Circus is one of the most widely syndicated comic panels in the world, appearing in more than 1,500 newspapers every day. You’d think there’d be a little quality control somewhere in that chain. Then again, this is The Family Circus, so maybe no one read it. The original comic appeared here. By the time you click the link, maybe they’ll have fixed the errors. Then again, this is The Family Circus, so . . . well, you know. Are horses and kings alike?